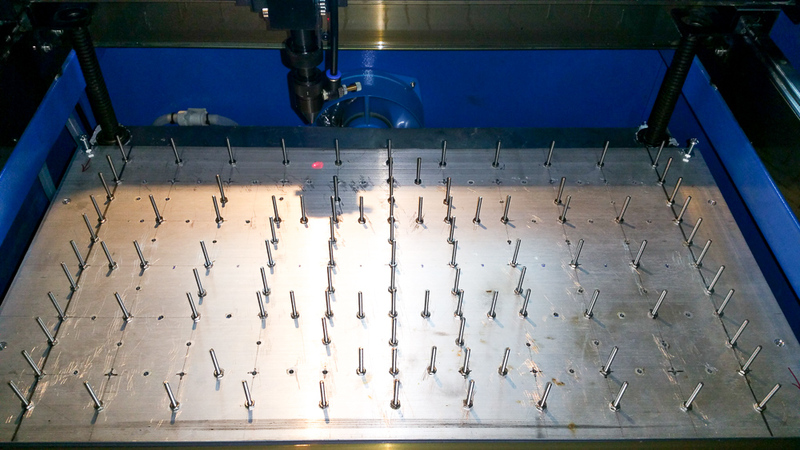 A while back I wrote about making pin “vector” table for laser cutter (here and here). There were some issues with it that I discovered later on. First issue with rivets height. I don’t know how I missed it by some of them had huge variation, resulting in very uneven distance from laser head. Second issue what with actual z-bed. It came out of aliment frequently and I got tired of adjusting it. Fortunately I came up with very simple idea of how to upgrade my pin table to solve both issues. First I used a bunch of #4-40 machine screws 1-1/2″ high. They were cheap, exactly same length and fit perfectly into existing 1/8″ holes I drilled for pop rivets! I just used some matching nuts to hold them in place. It took some time attach all of them, but it wasn’t very hard. From my experience with pin table there was no actually need it the number of pins that I used previously so I used less. I just clustered them in some spots (like middle) so they can hold smaller objects. Then I replaced angle brackets on sides with 4 adjustable feet. 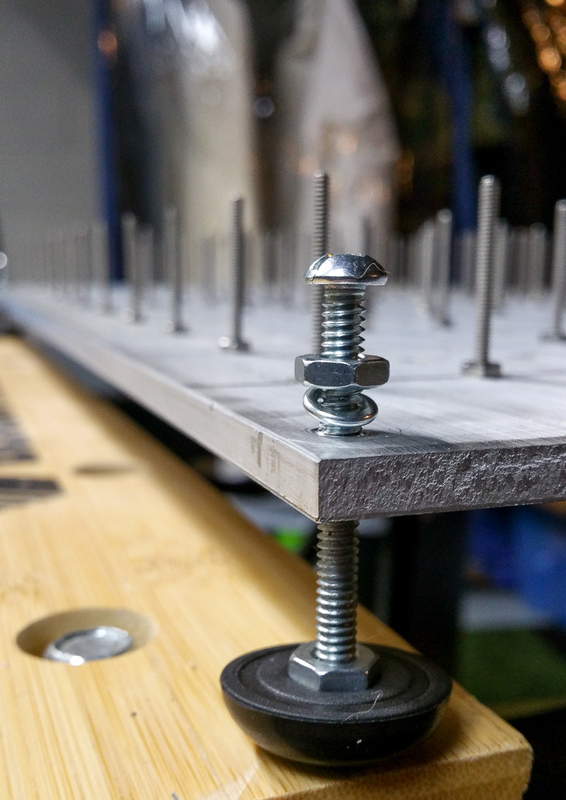 For this I drilled 4 holes using 5/16″ drill bit in corners to accommodate 10-24 machine screws. I used 10-24 tap to make threads in these holes. I used some rubber furniture feet I found at local hardware store and few 10-24 nuts to attach the feet, as you see in the picture. Now height of each corner can be adjusted regardless of how even Z-table is! This came out really well, and I don’t thin I’ll be making further modifications to the pin table.